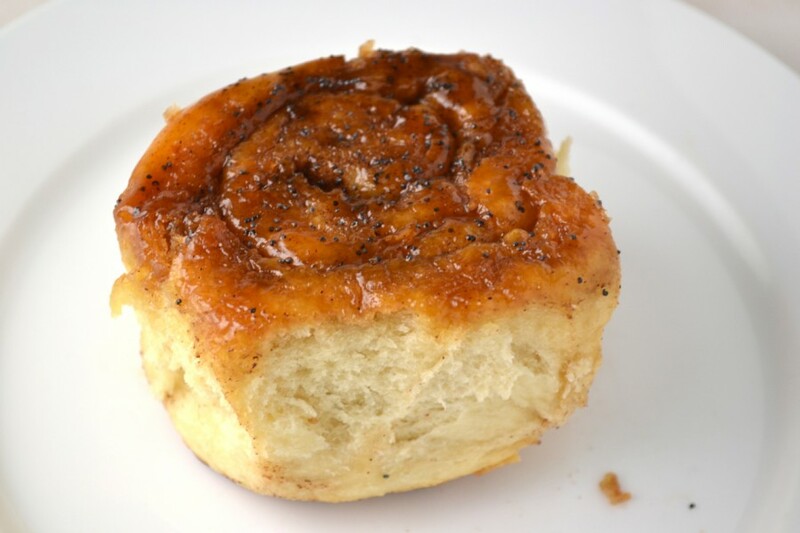 Cinnamon and caramel rolls seem to be everywhere these days, or at least photos of them are. The gooey texture is both photogenic and irresistible. I often see these well-known breakfast rolls prominently displayed on large white plates or cake stands at cafés around New York City. I almost always have to buy one. A version of my own was long overdue yet perfectly timed with the Holidays. The base of this recipe came from the “The James Beard Cookbook,” by James Beard but the inspiration came from two very different sources: a nostalgic Christmas memory and a popular babka bakery in New York City. Growing up in a cozy Minneapolis neighborhood, our neighbors exchanged small gifts (usually of homemade goodies) every Christmas. My family looked forward to the plate of Caramel Rolls that was routinely included in these gifts every year. Each roll was always the perfect size, not too big nor too small, with just the right amount of caramel. We would save them for breakfast on Christmas morning. The addition of poppy seeds to this nostalgic replication was inspired by Breads Bakery, one of my favorite bakeries in New York City. They are known for many delicious breads and pastries but their chocolate Babka is particularly impressive (they even ship it nationwide!). The deep chocolate swirls remind me of black poppy seeds and inspired me to combine them into this indulgent sweet bready treat. These delectable rolls can also be made plain, without poppy seeds, for a classic version. However, those of us who love poppy seeds, will enjoy the light crunch and texture that the spattering of poppy seeds provides. These caramel rolls may be different from those that I looked forward to every Christmas as a child, but they are better than what I find at most cafes here in the city. They just might make it on the table with the holiday desserts this year (as well as for breakfast, of course). Mix the yeast in a large bowl with ½ cup of the warm milk, honey, and sugar. Let stand a few minutes to proof. Melt butter in remaining milk and add the salt. Combine with the yeast mixture. Add the flour a cup at a time and stir it in with a wooden spoon. Continue mixing until dough is thoroughly blended. If you are using an electric mixer with a dough hook, knead at slow speed for 3-4 minutes, adding more flour as necessary, until dough is smooth and pulls away from the sides of the bowl. If kneading by hand, turn out dough onto a floured surface and knead until dough is very soft, smooth, and elastic. Transfer to a well-buttered bowl and allow to rise in a warm spot until double in bulk (around 1-2 hours). While dough rises, grease bottom and sides of a 9 inch round cake pan or 8 inch square baking pan. Mix Melt 4 tablespoons of melted butter with ¾ cup brown sugar. Pour into prepared pan. Punch down dough and turn out on a lightly floured surface. Roll out with a rolling pin into a rectangle, about ½ inch thick. 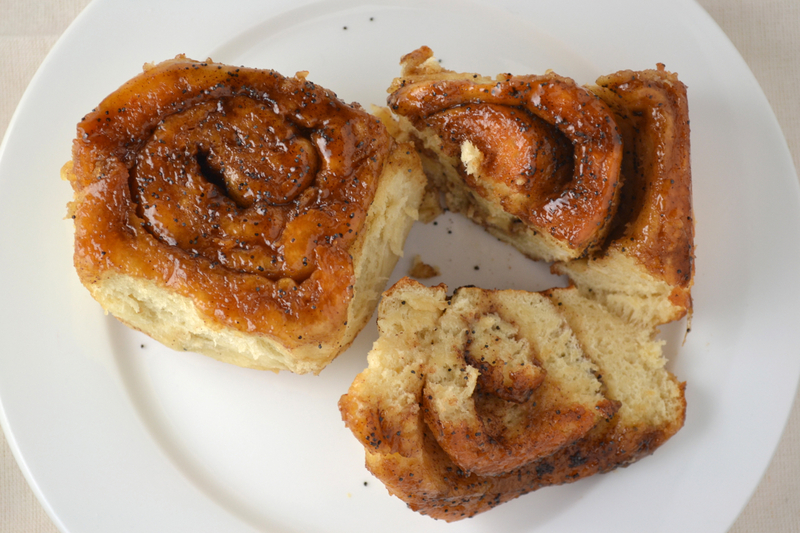 Spread with softened butter, brown sugar, cinnamon, and poppy seeds. Roll up and cut the roll into 1 – 1 ½ inch slices. Arrange slices in the prepared pan. Cover and let rise 30 minutes. Preheat oven to 425 degrees. Melt tablespoon. 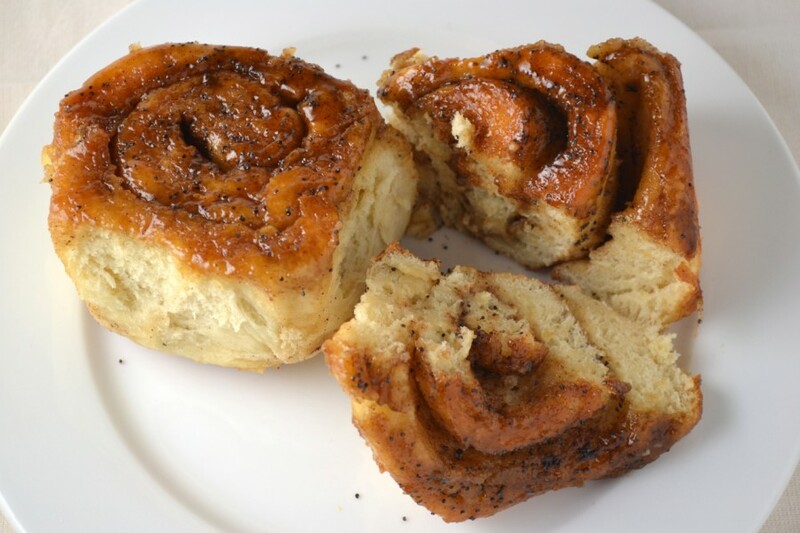 Brush the rolls with the butter and sprinkle with poppy seeds and cinnamon. Bake 15 minutes or until golden brown. Allow to cool slightly then run a butter knife along the sides of the pan to release the rolls. Place a serving plate on top of the rolls and while holding the bottom of the baking pan, flip upside down onto the serving plate so that the bottoms of the rolls are facing up and the caramel sauce covers them. Yield 9 large rolls or 18 small rolls. This recipe is amazing, thank you for sharing! Rolls are disappearing really fast. Thanks Lilly! So glad you enjoyed them.